While shooting footage for a conservation film about rhino poaching in South Africa, cameraman Garth De Bruno Austin was both pleasantly surprised and shocked when a rhino approached him for some TLC. Wild rhinos can be extremely dangerous, but this one had apparently gained trust for Austin, as she approached the human without any reservations. The 15-second encounter can be viewed below. 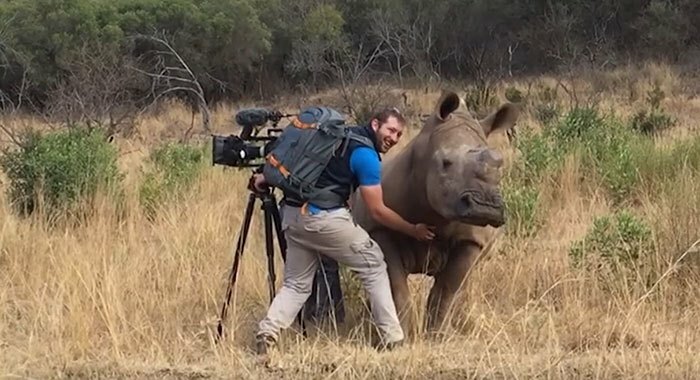 The wildlife cameraman was quick to share that he did not approach the rhino but instead was visited by her. This advice is valid when approaching all wild creatures, as one never knows how they might respond and should display respect in their territories. It was an ordinary day for Garth De Bruno Austin, who is capturing footage for a conservation film about rhino poaching.